I’ve been a big Nintendo fan since the early arcade days – It was 1981 when I played Donkey Kong for the first time in my local arcade and I was immediately hooked. It was a combination of the stance of the arcade cabinet, the glow of the monitor in the darkness and the way the controls worked in tandem with the animation and rhythm of the game – I thought “whoever made this game has created something special…so quirky and so fun…” and it wasn’t until I could see the cabinet in the light that I realized who Nintendo actually was and what they were making happen here in the US. arcade scene. I went on to play Donkey Kong Jr., Donkey Kong 3, Mario Bros, Popeye and most of the later Nintendo arcade games and loved every one of them. In fact, it was those games that drew me back to the arcade time and time again – they were always so much fun and so cheerful. For the next couple of years, I was literally in heaven – I had access to so many great games at my local arcade, and I played ALL of them – over and over again. In fact, it was these early games that started my budding interest in computers and electronics and drove me towards seeking a career in the computer industry, so in a way they have provided for me over the years and given back a lot of joy and professional opportunity. Fast forward to Christmas 1985 and I was ecstatic to open a brand-new NES as the main ‘family present’ for that year. I had always been an equally huge Atari arcade and 2600 fan, but by that time, my local arcade had since closed, and my access to video games had all but dried up with “the crash”. Fortunately for me (and I’m sure many others) Nintendo was there to help fill in a huge gap at the time and had a home run with NES. From that point onward, I actually felt a bit of a sense of loyalty to Nintendo as they had not only survived when others in the gaming industry had died out – they actually thrived and “brought the magic back”, in a sense. Admittedly, that’s part of the reason why I’ve always had a bit of “Mario myopia” (with some Zelda thrown in as well) and loved the Nintendo brand. All that being said, I didn’t really get very deep into the history of Nintendo as a company until the 2008-2009 time frame, which directly coincided with the time that I decided to get into the arcade and pinball hobby in earnest and begin collecting and restoring arcade games. As such, the very first game I purchased was my beloved Donkey Kong. I did what many who just get into the hobby do – I overpaid for what was then a very common game – but hey – I was so happy to have that critical piece of my childhood back in my possession. Frankly – I didn’t much care that I overpaid – I was just so glad to have it. From there, Donkey Kong Jr., Donkey Kong 3, Popeye, etc. al. cabinets followed and before I know it, I am what I would consider officially hooked on the arcades (again). It’s glorious! As with most hobbies, once in so far, it is easy to fall down that slippery slope and go “all in” and I’m no exception. In fact, this is really only the 2nd hobby I’ve really ever had (behind cars) that I can say that I’ve devoted so much of my adult hours to, so I feel the need to do as much as I can to help preserve the history of these games wherever possible. I enjoy them so much and I want to give back in some way, shape and form. With that in mind, I started the phase of my collecting career that many would refer to as “the hunt”… I sought out many titles from my childhood and began the process of building up my home game room with all the games I so fondly-remember playing back in my local arcade. Over the years, I’ve been able to locate and acquire most of the ‘golden age’ classics and quite a few titles that I was only introduced to after getting into the hobby even further. There are quite a few titles I never had the opportunity to play back in the 80’s so this hobby has really given me quite a bit to (re)discover and I love that aspect of it. Despite collecting and repairing the games and getting to play them, you quickly realize that there is a finite amount of hobby money, available space and free time after those three are combined in varying degrees, we all arrive at whatever we want our collection to look like. For me, I’ve always had a fondness for the Atari, Williams and Bally/Midway games of that era (with some Centuri and Taito thrown in for good measure) I ALWAYS come back to my Nintendo games as my preferred titles and (overall) most-enjoyable as well. As such, I figured that it would be awesome to have what many call a ‘killer Nintendo row’ and I’m lucky that I have that – certainly all the ones that I remember and love playing as a kid. 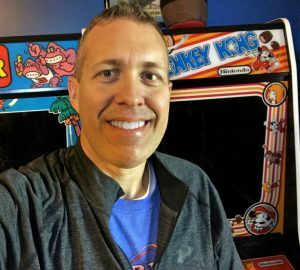 Where I’ve always felt I fell a little short in my ‘Mario myopia’ is that I just didn’t have a good perspective on what Nintendo’s arcade history looked like leading up to the release of Donkey Kong. So, I wanted to not only educate myself, but potentially find a few hidden gems in the back catalog that I had just never been exposed to. So I started at Radarscope and began working my way backwards and came across Sky Skipper (in MAME). It was easily my favorite of the (at the time) “unknowns” I was playing through and I thought to myself “man…this is a pretty sweet game”. Over time, I developed a fondness for it and began doing some research on the game, as I had never recalled seeing it in the arcades – or really hearing anything about it in the community – ever. Some searching on KLOV and Wikipedia turned up a small amount of information and I was able to piece together that the game was never released by Nintendo and was essentially a casualty of not making the cut within Nintendo. That led me to wonder why it was never released, was it considered finished, who designed it, etc. The sheer fact that it was so far along the line to be released, yet never saw the official light of day made Sky Skipper that much more intriguing to me. Despite all that, there really wasn’t much I could do otherwise and Sky Skipper sat on the ‘mental shelf’ for several years, as I didn’t know anyone who knew any more about it and there certainly didn’t seem to be any pressing interest by anyone on the Internet to tell the full story of the game… it seemed to be all but forgotten and destined to be relegated as an unfortunate footnote in Nintendo’s arcade legacy – until now. So imagine my intrigue when I saw Alex post his Youtube video where he detailed having two working PCB’s and told the story behind finding them and what it took to resurrect them back to the point that they would boot and play properly… seeing that video essentially re-kindled my interest in the game and I immediately reached out to him wanting to know more. We then scheduled a time to Skype and discuss his findings. During the course of the conversation, Alex mentioned to me that he was wanting to find someone in the US to purchase the PCB and commit to helping bring Sky Skipper back to life as his whole intent was to ensure the game’s history was preserved and that there would be a way for the game to be enjoyed again. That news immediately started the wheels in my head turning and as any sane Nintendo fan would do, I offered to him ‘to be that guy’ and work with him on the project – all without really considering what it would actually take to finish the project and make whole on the commitment – it just sounded like something I wanted to be a part of. Alex was gracious, but told me that he had a line of potential buyers already and needed to honor potential commitments on prior conversations. I totally respect that and get it – especially in such a small hobby/community as ours, so I figured it was a foregone conclusion that I’d have no real part in Sky Skipper going forward. I was fine with that, but I was definitely somewhat disappointed – I really wanted to contribute in some way but understood the situation. With that, I figured that the next time I’d hear about Sky Skipper again was when a major project would be announced by Alex and his teammate(s) and the collective Internet would be able to watch the project unfold with whatever resources they could pull together. Little did I suspect that a month or so later, Alex would reach out to me and offer me up the chance to buy the PCB and join the project. After hammering out an agreement and a workable path forward, I dove in and what you see here today is the result of our partnership. We both love Nintendo and the franchises brought to the world via their arcade legacy. We feel it our responsibility to do what we can to ensure Sky Skipper isn’t a lost part of that larger story and that it takes its proper place in the Nintendo (and arcade) history books. It might not have ever had the opportunity to be a cultural icon like Donkey Kong, but it is as important all the same and this is our version of the story – as best and as accurate as we know how to tell it. Long live Nintendo and long live Sky Skipper.